This has proved a mistake countless times throughout history. Zimbabwe is a classic example, where the Zimbabwean dollar, thanks to an incompetent government among other factors, experienced enormous levels of hyperinflation. At one point, inflation was estimated at almost 80 billionpercent in just a single month.The following image gives an idea of just how rapidly and absurdly a fiat currency can spiral out of control, once it reaches the point of no return. That said, just as with everything, there’s survivorship bias here. What you don’t hear about are the profusion of people who lost their entire fortunes investing in cryptocurrency. While there are a few ways you can beat all the odds and come out vastly ahead in cryptocurrency, there are infinitely moreways you can lose everything you put into it and end up in a much worse place than where you started. Conversely, if you bet at even odds that a six sided dice roll would come up 4 or higher, your expected value would be positive, as you would be correct 2/3 times. Hence, if you repeated this bet an infinite number of times, you would be guaranteed to be earning more money than you lost. The crash proved to be the best thing that could have happened, however, because it gave me time to actually do my research and learn about bitcoin, and have real reasons for believing in it long term, at a point in time where the price was unusually deflated. As a consequence, I was able to buy morebitcoin at the very bottom of the market, around $230 or so, when I became truly convinced of bitcoin’s long term potential. 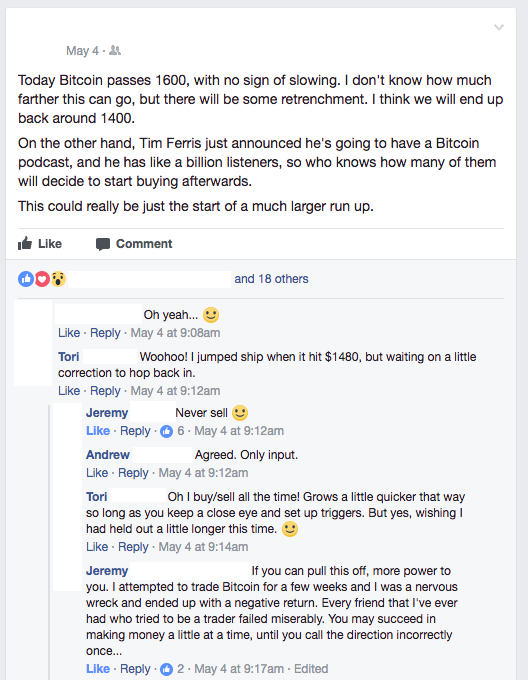 I was also lucky enough to decide not to sell the bitcoins I had originally purchased for $1000 or so, and ultimately saw even those return 250%+ in profit. I think that this is a great strategy, and personally practice it with a few modifications. While I’ll never sell at any price essentially (unlike other investments, bitcoin and cryptocurrencies are unique in that they arecurrencies, and consequently if they succeed, you won’t have to sell them to gain value from them. You can just use them directly, just as you might US dollars or any other form of currency. In the manner that I use the word sell here however, I mean that I likely won’t sell at any price under $100,000, as that’s where I personally see the moonshot value of bitcoin going towards, in the slight chance that it does succeed), no matter how high the price rises in the short term, if and when the price becomes particularly low as a result of a cratering market, I will look to buy more than I normally would, to double down on my investment here — all the while keeping in mind never to invest more than I’m perfectly willing to lose entirely. A Trezor also allows you to set multiple passwords that open secret vaults to different wallets on your device, such that even if in some crazy scenario someone just kidnaps you and threatens to beat you with a wrench until you give them your coins, you can just give them a second password to another wallet that holds say $500 in cryptocurrency instead of $10 million, and there’s no way for them to know that that’s not all the money you had on your Trezor. A Trezor will give you your own personal wallets for eitcoin, ethereum, dash, zcash, and litecoin, as well as any ERC20 token built on top of ethereum. Another benefit of holding coins yourself, in a hardware wallet or elsewhere, is that you know that you 100% own all of your money. Exchanges are just like banks, in the sense that you trust them to hold your money for you. If they end up losing that money to hackers or stealing it themselves, you’re out of luck. This isn’t just a scary bedtime story — countless cryptocurrencyexchanges have been embezzled or hacked (an enormous percentage, actually), and hundreds of millions of dollars have been lost. Ben Yu is a Thiel Fellow and Founder of Sprayable Energy.